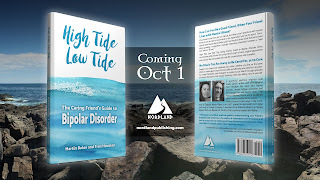 Join us both and a host of friends on Saturday October 1 for the Official Launch Party for our new book, High Tide, Low Tide: The Caring Friend’s Guide to Bipolar Disorder. We hope you are as excited as we are! The Facebook event will run between 1pm and 5pm Eastern Time (6pm through 10pm in the UK) on Saturday October 1. High Tide, Low Tide: The Caring Friend’s Guide to Bipolar Disorder is published by Nordland Publishing and is available now at Amazon.com and Amazon.co.uk.